We've met this individual before somewhere, and he's running a very slick operation on the tube. We even had to commend him for his slickness, because it is very professional - when you are out to swindle, it simply has to be, there is no other choice. As most people's attention spans have dwindled to literally minutes and seeking knowledge for them has become reduced to watching byte-sized vids on the tube (because reading and studying books is so excruciatingly painful and boring), the situation is ripe for individuals such as this one to come along and play the pied-piper. Citing isolated, decontextualized statements of the Scholars or brandishing their phraseology whilst concealing the reality of what these scholars meant by it is the method by which this individual and countless others deceive and misguide the people away from the Prophetic Sunnah and instead to the misguided innovations they have entered into the religion. He is holding up the book of Imaam al-Nawawi, (تهذيب الأسماء واللغات) and is impressing upon the byte-sized deen-learner how Imam al-Nawawi, allegedly, is sanctioning the innovations (in worship) that he and his likes spread amongst the Ummah. The reality is not as simple as he makes it out to be and is in fact otherwise, and we will address this matter, by Allaah's permission in this article. To appreciate this article fully, please be sure to read and digest Part 1, Part 2, Part 3, Part 4, Part 5, and Part 6. Also useful for you to read is the definition of bid'ah, and its basis from the Sunnah and understanding that it is of two types (haqiqiyyah and idafiyyah) from the angle of how it relates to Shariah evidences (see this article, and this one). It is also crucial for you to study and understand this diagram in conjunction with the other parts of this series which have preceded. The first type: A mere mention of bidah being either "praiseworthy innovation" (البدعة المحمودة) or "blameworthy innovation" (البدعة المذمومة) or bidah being of categories such as obligatory (الواجب), recommended (المندوب) and permissible (المباح) but without any further elaboration and giving of illustrative examples, because within the context in which they are writing, they are only intending to make a quick hint or reference to the matter. The second type: A mention of those phrases and terms but this time with full elaboration and illustrative examples which reveal their intent and which show exactly what their objective is in using these terms and classifications. Examples of each of these types will be clear as we progress in this article, but the trick and deception of the Innovators is that they will gather together as many statements as they can from the first type, or selectively quote parts from the second type, and then present them to the people and subsequently make very general statements like, (هذا ما عليه كبار العلماء وهذا ما نحن عليه), "This is what the Major Scholars are upon and this is what we are upon." So your byte-sized deen learner only gets a surface-level, shallow understanding and has only learned terms and phrases yet is none the wiser about what these Scholars really intend by the use of these terms and classifications. All he knows is that the scholars used these terms and made these classifications, but any mention of them has been stripped of the explanation, meaning and illustrative exemplification. And even those quotes which may have added elaboration have been decontextualized by removal of the appropriate information which provides all the details as to what is really intended. The swindler is therefore able to lead the intended target audience into thinking that innovating into the matters of worship to bring oneself closer to Allaah is perfectly legitimate and sanctioned by these scholars, and that this is, allegedly, "what the Major scholars are upon." So the fraud is complete, having been executed to perfection with the slick presentation, and the deceiver is free to move on to the next swindle. The deceptive individual pictured earlier has posted a few videos and in each of them he has cited a quote from al-Nawawi from the same place in one of his books (تهذيب الأسماء واللغات). Al-Nawawi is discussing the entry (بدع) and he does actually elaborate upon it in detail, but this crooked Habashite Sufi pictured above eliminated the part where al-Nawawi explains the intent behind the classification (through a full citation from al-Izz bin Abd al-Salam). Each quote that we bring below is the subject of a separate video created by these people. Their intent is to isolate each of the general statements that offer no detail or explanation as to the intent and purpose behind the classification of these scholars so that the intended audience thinks "how numerous are these statements that legitimize innovation" when they see all these individual videos. So lets now analyze those isolated statements that are used as part of the bait. Al-Bidah, with a kasrah on the letter baa, in the Shariah it is the introduction (invention) of that which is not found in the era of the Messenger of Allaah, and it is divided into [that which is] good and [that which is] repugnant. So this quote is isolated like this and presented and a person thinks, "Hey, yes they are right, there is "good bidah" in the religion," but little does the person know what exactly al-Nawawi (and others) intend by this phrase - that part is kept hidden. 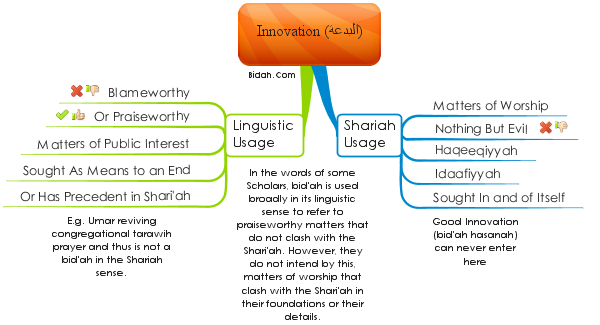 Innovation is divided into obligatory (waajibah), unlawful (muharramah), recommended (makruhah), disliked (makruhah) and permitted (mubaahah), and the way to knowing that is to view the innovation in light of the Shariah principles, and so if it enters into the principles of obligation, then it is obligatory, or [if it enters into] the principles of unlawfulness, then it is unlawful, or if recommended, then recommended, or if [its falls into] the disliked, then disliked, or the permitted, then permitted. This is the well known statement of al-Izz bin Abd al-Salaam which has been quoted from him by other authorities such as Ibn Hajar in al-Fath, and al-Shatibi also quotes it (and proceeds to refute it and show that it is itself an innovation having no proof). Deception Alert: Note that this Habashi Sufi swindler did not complete al-Nawawi's citation from al-Izz bin Abd al-Salam wherein he elaborates with examples and explains exactly what he means by each category, which reveals the true intent and position of al-Nawawi (and the other Shafi'ite jurists). Inshaa'Allaah, we will provide the full text and translation further below. Newly-invented matters are of two types: The first of them is what opposes [something from] the Book, or [something from] the Sunnah, or a narration [from the Companions], or [a matter of] consensus, this is the misguided innovation. And the second is what has been introduced of goodness and there is not a single scholar who opposes it. This is newly-introduced yet not blameworthy and Umar (radiallaahu anhu) had said about the qiyam (al-layl) in the month of Ramadan, "What an excellent innovation this is," meaning, that it is newly-introduced and was not previously done. We have already addressed this quote in the article on the statements of al-Shafi'i (see here) so please refer to that. However, it is clear that al-Shafi'i's words are in relation to bidah from a purely linguistic meaning and this is very clear from what he says at the very end when he quotes the saying of Umar and then says, (يعني أنها محدثة لم تكن), "meaning, that it is newly-introduced and was not previously done..." and al-Shafi'i knows that this was in fact done by the Messenger (alayhis salam) but abandoned because he (alayhis salaam) feared it might become wajib (obligatory) upon his Ummah. So this act of worship has specific proof in the Sunnah, but its re-enactment is referred to by al-Shafi'i as "bidah" purely from a linguistic meaning and not a Shariah meaning, and this act does not have opposition to the Shariah, rather it is in perfect agreement with the Shariah, with the Prophetic Sunnah, in its foundations and details. Hence, it is not an innovation in the blameworthy sense. All the above three quotes were all from the same section. But what was left out? Well lets go and take a look! What Has Been Deliberately Omitted! For the obligatory innovations are examples, from them: [First] Being occupied with the knowledge of grammar by which the speech of Allaah and the speech of the Messenger (sallallaahu alayhi wasallam) is understood. This [innovation] is obligatory because the preservation of the Shariah is obligatory, and its preservation cannot be maintained except by that, and that without which an obligation cannot be fulfilled is itself obligatory. Second, preservation of the [meanings of] obscure words in the language occurring in the Book and the Sunnah. Third, laying down the foundations of the religion and of jurisprudence. Fourth, speech about al-jarh wal-ta'deel (criticism and appraisal) [of narrators], and distinguishing between the authentic from the weak. The principles of the Shariah have themselves indicated that preserving the Shariah is fard kifaayah (collective obligation) regarding that which goes beyond the capacity of an individual, and that cannot be fulfilled except by what we have mentioned. And for the unlawful innovations are examples, from them: The [belief] doctrines of al-qadar, and al-jabar, and (those of) the Murji'ah and Mujassimah. Refuting these (people) is from the obligatory innovations. For the recommended innovations are examples, from them: Setting up hospices and schools and every benevolent endeavour not present in the first era, and (also) from (the examples) is at-Tarawih, and speech regarding the details of tasawwuf, and [also] argumentation, from which is the setting up of gatherings for deduction of evidence (in knowledge based matters) [only] if Allaah, the Exalted's face is sought by that. And for the disliked innovations are examples, from them: Adornment of the mosques, and decoration of the mushafs [of the Qur'an]. And for the permitted innovations are examples, from them: shaking hands after the morning and late afternoon prayers, and from them is taking liberties in that which is great pleasure in terms of food, drink, clothing and residence and wearing shawls and widening of the sleeves. There could be some differing regarding some of these matters and some of the Scholars may place them amongst the disliked innovations, and others may place them amongst the sunnahs that were actually performed in the time of the Messenger (sallallaahu alayhi wasallam) and also after his time, and this is like pronouncing the isti'aadhah and basmalah in the prayer. [Al-Nawawi:] This is the end of his [al-Izz's] speech. And you are very strongly recommended to refer to the more detailed diagram (click on the image below) we have in Part 7, which breaks the whole issue down more clearly and vividly, and leaves no ambiguity as to what these Shafi'ite jurists meant at all. قوله : "وكل بدعة ضلالة". هذا عام مخصوص والمراد غالب البدع قال أهل اللغة هي كل شيء عمل على غير مثال سابق. قال العلماء : البدعة خمسة أقسام : واجبة ومندوبة ومحرمة ومكروهة ومباحة. His (sallallaahu alayhi wasallam's) saying (كل بدعة ضلالة), "Every innovation is misguidance." This is a generalisation which has been qualified (by other texts), and the intent behind it is the majority of innovations (not all of them). The scholars of the language have said that [bidah] is: "Every thing that is performed without any prior example (precedent)." The Scholars have said bidah is five types, obligatory, recommended, unlawful, disliked and permitted. So from the obligatory [innovations] is organization and composition of the evidences of the Mutakallimin for refuting the atheists and innovators and whatever resembles that. And from the recommended is authoring of the books of knowledge and building schools and hospices and other than that. And from the permitted is (taking pleasure through) indulging in the variety of foods and other than that. And as for the unlawful and disliked (types), then they are very clear. And I made this matter clear alongside its evidences in Tahdhib al-Asmaa wal-Lughaat and by knowing what I have mentioned, it becomes known that the hadeeth is [considered] to be a generalization that is qualified, and likewise (is the case with) whatever resembles it form the reported ahaadeeth. And supporting what we have said is the saying of Umar Ibn al-Khattab (radiallaahu anhu) regarding Tarawih, "What an excellent innovation this is." And that the generalization in his saying "Every innovation" is supported by the word "Every (كل)" does not prevent from that it is subject to being qualified such as what occurs in His saying (تُدَمِّرُ كُلَّ شَيْءٍ) "Destroying every single thing (46:25)" [Meaning, even though "every (كُلَّ)" was used, not everything was actually destroyed, hence it is a generalization that is qualified with exceptions]. Note the middle paragraph in bold was conveniently ommitted just in case the audience clicks on and understands what is going on and that al-Nawawi (and al-Izz bin Abd al-Salam) certainly do not intend what todays low-life Innovators, with all their dishonesty and academic treachery, intend. As for the issue of (كل), meaning "all, every" being a qualified generalization, this is discussed further below and al-hamdulillaah, this only supports us against the Innovators, it is not a proof for them, it is a proof against them, it is from our goods, not theirs, they have merely stolen it and are pretending it belongs to them. If we analyze the examples given again, we see that the obligatory innovation appears to be ways and means that come under the principle "that by which an obligation cannot be fulfilled is itself obligatory" and the recommended innovation appears to be ways and means that facilitate already defined Shariah goals (teaching, looking after the ill). So we are really speaking here, in the obligatory and recommended innovations, the ways and means (wasaa'il) that support Shariah goals. These are all from the maslahah mursalah. And the permitted innovation is simply novelties in what has the ruling of being permitted in the Shariah, which is food, drink, clothing, and residence. New varieties or forms of these are "innovations" which are permitted (these are your pizzas and burgers and your hoodies and sneakers and your carbonated juices and your marble buildings and so on). Nothing about innovations in worship (ta'abbud) being hasanah here! His (sallallaahu alayhi wasallam's) saying, "Whoever enacted a good sunnah in Islam will have its reward ..." to the end of [the hadeeth]. This contains encouragement to initiate good deeds and to enact the good sunnahs and a warning from inventing falsehoods and repugnant things (mustaqbahaat). And the reason behind this statement in this hadeeth is that he (the narrator) said at the beginning of it, "Then a person came there with a money bag which his hands could scarcely lift; in fact, they could not (lift). Then the people followed continuously (in giving)..." So the great virtue was for the one who began this goodness and the one who opened the door to this benevolence. And within this hadeeth is the qualification of his (sallallaahu alayhi wasallam's) saying, "Every newly-introduced matter is an innovation, and every innovation is misguidance" and that the intent behind it is the newly introduced matters and blameworthy innovations. And the explanation of this has already preceded in Kitab al-Salat al-Jumu'ah and we mentioned there that innovations are of five types: obligatory, recommended, unlawful, disliked and permitted. The First: Concerning The Qualification of the Phrase (كل بدعة ضلالة) That It is Not Absolute and Unrestricted But Is Qualified. This is one of the favourite doubts of the Innovators from the speech of al-Nawawi and what they don't realize is that this is actually a proof in our favour. It supports us, and al-Nawawi is with us in the reality of the affair. And the truth is that al-Nawawi is essentially correct because he is (as are the other Shafi'ite jurists) looking at this word (بدعة) and seeing it upon its linguistic meaning only, which incorporates all newly-invented things, blameworthy or praiseworthy, religious or otherwise. Hence, when the Messenger (alayhis salaam) says (كل بدعة), "Every innovation...", this clearly is a generalization needing qualification upon al-Nawawi's view. And we don't disagree with that, in fact it is absolutely correct to state that it needs qualification and restriction. And this is the purpose of the classification found with the Shafi'ite jurists. Conversely, the majority of the Scholars of the Sunnah, when they look at this wording (كل بدعة ضلالة), they are upon the understanding that the word (بدعة) has already been qualified in the hadeeth of Aa'ishah (مَنْ أَحْدَثَ فِي أَمْرِنَا هَذَا مَا لَيْسَ مِنْهُ فَهُوَ رَدٌ), which restricts and qualifies innovations in religion only, since the Messenger said, introduces into this affair of ours", and hence when the Messenger (alayhis salaam) says (كل بدعة), this saying is absolute, unqualified and unrestricted and applies to every innovation in the religion. So the issue here is that al-Nawawi is absolutely correct that the word (كل) is indeed a generalization that is qualified - from his particular perspective of things (which is to see the word "bidah" purely with its linguistic meaning). The difference is that most of Ahl al-Sunnah believe that that word (بدعة) is already qualified by what is in the hadeeth of Aa'ishah (radiallaahu anhaa), whereas al-Nawawi and the Shafi'ite jurists have brought a classification to enable the qualification of what they see to be a word only having its broad unqualified linguistic meaning which is "anything without any prior example whether praiseworthy or blameworthy" Now because this definition would include (in the modern era) your pizzas, burgers, hoodies, sneakers, brick and marble houses, the internet, mobile devices, types of technology and so on, these Shafi'ite jurists simply made classifications to allow these types of things to be excluded from what is otherwise the blameworthy bidah (innovation). Hence, they said there is an obligatory innovation (so we would say putting the refutations of atheists and defences of the Qura'n and the Sunnah in digital format for devices and for the internet is an obligation) and a recommended innovation (setting up online schools for teaching of Qur'an and tajweed is a recommended innovation), and a permitted innovation (enjoy that pizza, wear that hoodie and don those cool sneakers). In other words, food, drink, clothing and residence not present in that way before. So it becomes clear after all this that in reality there is no difference between these two groups of Scholars, they all have the same understanding, but are just simply using two different languages to express it. Having said this, we do consider the classification of bidah into wajib, mandub and mustahab to be an error and the truth is with the Salaf and the likes of al-Shatibi who clarified this matter. Al-Mundhir bin Jarir reported on the authority of his father: While we were in the company of the Messenger of Allaah (sallAllaahu alayhi wa sallam) in the early hours of the morning, some people came there (who) were barefooted, naked, wearing striped woollen clothes, or cloaks, with their swords hung (around their necks). Most of them, in fact, all of them, belonged to the tribe of Mudar. The colour of the face of the Messenger of Allaah (sallAllaahu alayhi wa sallam) underwent a change when he saw them in poverty. He then entered (his house) and came out and commanded Bilal (to pronounce adhaan). He pronounced adhaan and iqaamah, and he (the Prophet) observed prayer (along with his Companions) and then addressed (them reciting verses of the Holy Qur'an): "O mankind, fear your Lord, Who created you from a single being" to the end of the verse, "Allaah is ever a Watcher over you" (4:1). (He then recited) a verse of Sura Hashr, "Fear Allaah and let every soul consider that which it sends forth for the morrow and fear Allaah" (59:18). (Then the audience began to vie with one another in giving charity.) Some donated a dinar, others a dirham, still others clothes, some donated a measure of wheat, some a measure of dates; till he (the Prophet) said: (Bring) even if it is half a date. Then a person from among the Ansar came there with a money bag which his hands could scarcely lift; in fact, they could not (lift). Then the people followed continuously (following the example of this man), till I saw two heaps of eatables and clothes, and I saw the face of the Messenger (sallAllaahu alayhi wa sallam) glistening, like gold (on account of joy). The Messenger of Allaah (sallAllaahu alayhi wa sallam) said: He who sets a good precedent in Islam, there is a reward for him for this (act of goodness) and reward of that also who acted according to it subsequently, without any deduction from their rewards; and he who sets in Islam an evil precedent, there is upon him the burden of that, and the burden of him also who acted upon it subsequently, without any deduction from their burden. Note how al-Nawawi used the action of that one man (the one who came with a bag full of money) as an example of an "innovation" which - in his view - qualifies the other statement of the Messenger (كل بدعة ضلالة). This man from the Ansar was the first to bring a whole bag of money and there was no prior example for this (amongst the people and those giving), so linguistically, he did make a "good innovation." However, his practice is not really an innovation, as it is simply an enactment of an already existing Sunnah which is giving charity, however he gave in a way that others had not. He never introduced or innovated anything into the deen of Islam that which was not already from it. But the fact that al-Nawawi used this example to illustrate how the other saying of the Messenger (كل بدعة ضلالة) is qualified, only strengthens whatever we have said above, and it shows that these Scholars (Shafi'ite jurists) simply included either the re-enacted Sunnah, or the revived Sunnah or the commanded Sunnah (which we have illustrated in our detailed diagram) into their terminology of "praiseworthy innovation" - and intending that from a purely linguistic sense, because they are wrongly presuming that the use of the word (بدعة) was intended by the Messenger with its linguistic meaning only, and this is not correct, since the hadeeth of Aa'ishah (radiallaahu anhaa) is the foundation and basis of the meaning of (بدعة), innovation, in the Shariah. As of now we have some unfinished business and if you recall from a little earlier, we said that in this last quote of al-Nawawi (in Kitab al-Zakat) there was a baseball bat and a crowbar in the form of two sentences included within that passage (highlighted in yellow and underlined in red). The time has come now to metaphorically make use of these tools that Allaah the Exalted decreed - fifty-thousand years before He created the creation - would in fact be delivered to us (Ahl al-Sunnah, the followers of the Salaf) buried in al-Nawawi's words, to be let loose upon the flimsy doubts of the Ahl al-Bid'ah. Allaahu Akbar! And a prostration of gratitude! These are our goods, returned to us, Ahl al-Sunnah, followers of the Salaf, the Salafis, and abject humiliation of the Innovators from the Sufi grave and saint-worshippers and others besides them. Their swindle has collapsed and their spurious attachment to the statements of al-Nawawi (and other Shafi'ite jurists) laid bare. Why is Salat al-Ragha'ib and Salat Nisf Sha'ban not good bidah? Is prayer not from the Shariah? Is dhikr not from the Shariah? Don't these acts of alleged worship have a basis in the Shariah? Where are the arguments of the contemporary Innovators in the face of this fatwa of al-Nawawi! This fatwa can also be found in the printed version of his fatawa in "Fatawa al-Imaam al-Nawawi" organized and arranged by his student Alaa al-Din Ibn al-Attaar, published 1411H in Egypt (on page 31). Again, pay very careful attention to the words used - and then take these choice of words of al-Nawawi and compare them to his commentary on the hadeeth (من سن في الإسلام سنة حسنة) quoted earlier - and you will see the true and real intent of al-Nawawi revealed walhamdulillaah! The Shaykh of Islam al-Nawawi was asked about the well-known Salat al-Ragha'ib performed on the first Friday night of Rajab, whether it is bid'ah or sunnah? The Answer: It is a repugnant, rejected innovation, with the most severe rejection, it comprises many evils, hence it is specifically designated to abandon it and turn away from it and to show rejection againt the one who does it. And it is upon the ruler (one in authority) - may Allaah grant him success - to prevent the people from doing it, for indeed he is a shepherd and every shepherd is responsible for his flock. The scholars have written books in rejection and rebuke of it and declaring those who perform it as fools. One should be not deceived by the abundance of those who perform it in many of the cities, and nor that it is mentioned in [the books] Qut al-Qulub, or Ihya Ulum al-Din and their likes, for it is a futile innovation. And it is authentically related from the Prophet (sallallaahu alayhi wasallam) that he said, "Whoever introduced into this affair of ours that which is not from it will have it rejected." And in the Sahih (of Muslim) that he (sallallaahu alayhi wasallam) said, "Whoever introduced into this affair of ours that which is not from it will have it rejected," and in Sahih Muslim and others that he (sallallaahu alayhi wasallam) said, "Every innovation is misguidance." And Allaah the Exalted has ordered us to return to His Book whenever there is a dispute, so He, the Exalted said, "And if you dispute regarding any matter then return it back to Allaah and His Messenger" (4:59), and He did not ordder the following of the ignoramuses, and nor being decieved by the errors of those who have erred, and Allaah knows best. Allahu Akbar! And another prostration of gratefulness. Allahu Akbar! And another prostration of gratefulness. The Innovators have just received a mighty pounding in our cage. There is absolutely no doubt that when al-Nawawi says that the statement (كل بدعة ضلالة) is a generalization that has to be restricted and qualified, he means that it is qualified to remove what would otherwise enter into the purely linguistic meaning of (البدعة), such that whatever remains would only apply to blameworthy innovations (in the Shariah sense) and all other matters (like building schools, and laying down foundations of Islamic sciences, revival of what is Sunnah to begin with, and new types of foods, drink, clothing and homes) are excluded from this generalization. He is absolutely right, upon his perception of the matter, and there is nothing in this at all for the Innovators! Also pay special attention to the fact that al-Nawawi included amongst the reasons that make an act to be a detestable innovation, the creating of the presumption amongst the people that it is a Sunnah when it is not - and how many an act is there which these Innovators have misguided the people into thinking it is the Sunnah and abandoning it is a bidah?! And as they try to flee on their heels with their dodgy merchandise we can turn swiftly to the result of our acid test. Matters of broad public interest (maslahah mursalah) which may either be obligatory or recommended, hence, the examples given by al-Izz bin Abd al-Salam and followed by al-Nawawi, such as being concerned with Arabic grammar (obligatory) and building schools (recommended). Matters which are merely permitted, which include enjoyment of new forms and types of food, drink, clothing, residence. Matters of goodness which in and of themselves are established in the Shariah (giving charity for example), but which a person enacts from his own initiative (in a way no one did before him) and is subsequently followed by others. An example of this could be when a person takes half his savings and travels to poverty-stricken area and feeds the people and builds wells for them. So he is then followed by a dozen others. So no new act has been innovated here into Islam, but a person has simply performed an act which no one preceded him in, and it became an example for others besides him. So he instituted a "sunnah hasanah" to use the Shariah term, or if you want to use the language of others, "bidah hasanah", in other words, an innovation purely with its linguistic (not Shariah) meaning, and this is true because prior to this man, no one else took half of his own wealth and travelled to the poverty stricken place and fed the people and built wells for them. Once this is clear, the acid test is to see these same scholars pointing out - what is to them - an instance of a heretical innovation and this allows us, without any ambiguity, to identify exactly what they mean and what they do not mean by their terms and classifications in this regard. And we have - in everything we have quoted - the implementation of such an acid test. So the results of the acid test are clear, neither al-Nawawi nor al-Izz bin Abd al-Salam laid down these terms or classifications to enable the justification of innovations in the religion. The reason why they used these classifications and terms is very apparent and has been very sufficiently explained. The bottom line is that these scholars never set out to sanction innovation in worship and all of their speech about bidah is from the angles we have explained in this article, not from the angle of permitting departure from the Sunnah and turning to innovations, even if these innovations have a basis and support from the Shariah from some angles (like Salat al-Ragha'ib for example). We see clearly the vehemence with which al-Nawawi spoke against two innovations, Salat al-Ragha'ib and Salat Nisf Sha'ban, and it proves that these Shafi'ite jurists opposed the bidah haqiqiyyah and bidah idafiyyah (see this article) and despised innovations in worship. And if it is counter-argued that these Scholars had things which you might oppose and count as opposition to the Sunnah, then that has its own explanation in that a scholar may fall into opposition for a variety of different reasons, from them, thinking a hadeeth to be authentic when it is not, or interpreting Prophetic text(s) in a way that is incorrect, or simply being mistaken. In any case, that which constitutes proof is what is found in the Book and the Sunnah and the Ijmaa' of the Companions so whoever tried to contradict these three matters with the opinions of later scholars is in clear manifest error. By Him in whose hand is my soul, I have not left anything which brings you closer to Paradise and distances you from the Fire except that I have commanded you with it and have I left anything which brings you closer to the Fire and distances you from Paradise except that I have prohibited you from it. Related by Ahmad and Ibn Khuzaymah. So we ask Allaah to either guide this person or break his back and relieve the Muslims of his harm, and what a great ocean lies between al-Nawawi (rahimahullaah) and those people who are out to rob the Muslims of their deen with such deception and lies and distorting the true and real intent of the Muslim Scholars.